Staff and students of the Discipline of Radiation Therapy recently took part in a social media campaign to highlight the Union for International Cancer Control’s World Cancer day, held every year on 4th of February. World Cancer Day aims to save millions of deaths annually by raising awareness and education about cancer, and promoting initiatives aimed at prevention and control of disease. 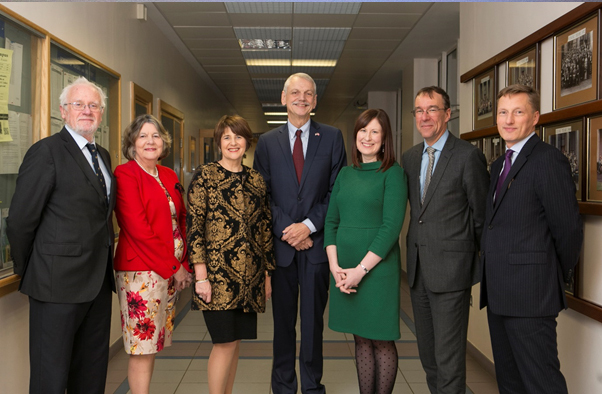 The Discipline of Radiation Therapy at Trinity College Dublin, celebrated its 25th anniversary on the 14th of December 2018, with a celebratory evening held in the Trinity Centre for Health Sciences, St. James’s Hospital campus. 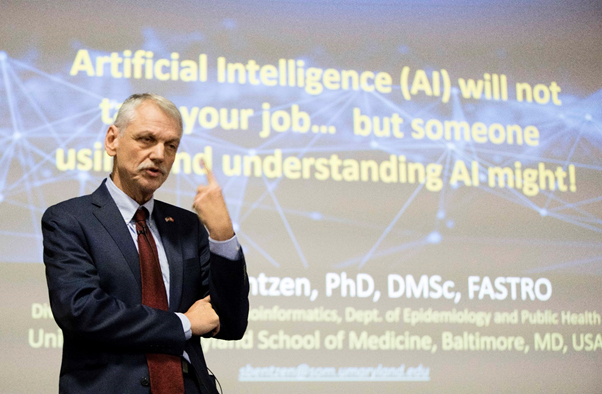 Prof. Søren Bentzen, University of Maryland, USA was the keynote speaker. The event reflected on the many changes which the Discipline of Radiation Therapy over the past 25 years. 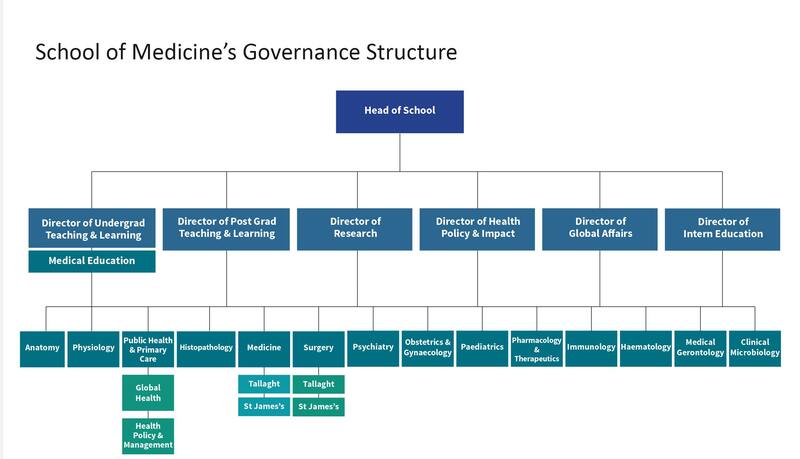 Starting in St. Luke’s Radiation Therapy Department, Rathgar in 1983 the programme awarded a diploma qualification but changed to an honours degree in 1993 when it joined the Faculty of Health Sciences, Trinity College. 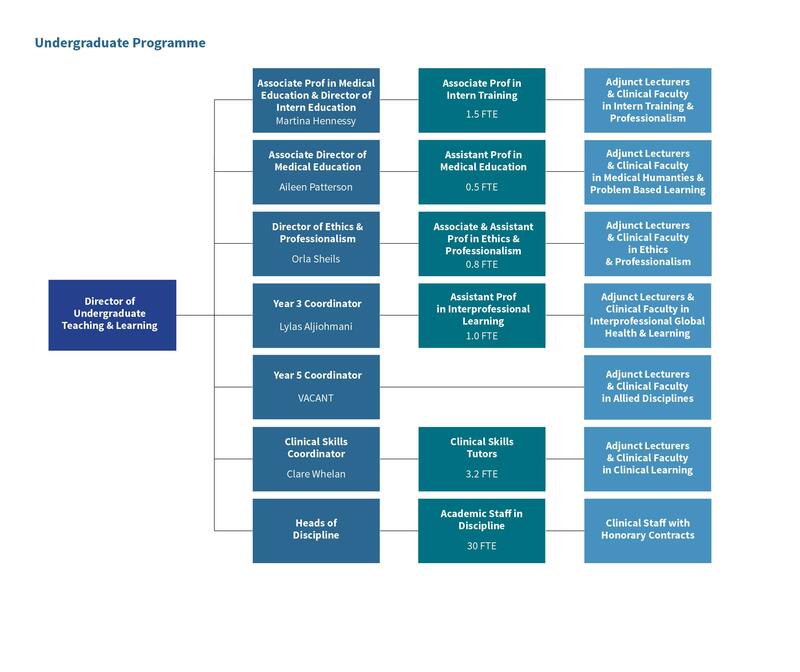 In the past few years, in response to the need for radiation therapists to have higher level degrees, staff in the Discipline developed an online Master’s programme. This programme is, designed for healthcare professionals working full-time to undertake part-time studies. 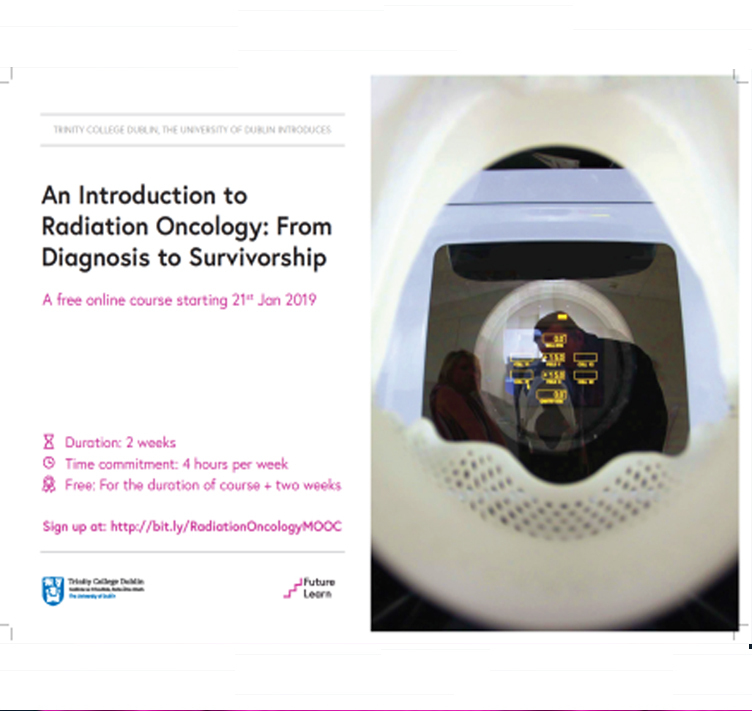 Discipline of Radiation Therapy develops Massive Open Online Course (MOOC) - An Introduction to Radiation Oncology-From Diagnosis to Survivorship. The School of Dental Science at Trinity College Dublin launched a book of memoirs, thoughts and advice from mouth, head and neck cancer survivors and healthcare professionals involved in their care. 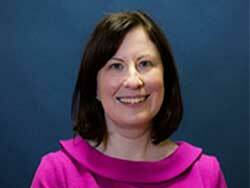 The book is entitled Word of Mouth - Coping with and Surviving Mouth, Head and Neck Cancers. Word of Mouth includes both stories from people with direct experience of diagnosis, treatment and recovery and advice from healthcare professionals. Agnella Craig, Assistant Professor in the Discipline of Radiation Therapy contributed the section on Radiotherapy contained in part one of this book- What To Expect From Treatment: Advice From The Professionals. 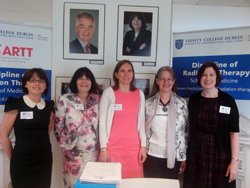 Discover Research Dublin was financed by the European Commission’s 7th Framework Programme for Research under the Marie Curie People Programme Research conducted by the Applied Radiation Therapy Trinity (ARTT) group at the TCD Discipline of Radiation Therapy was show cased at this event. 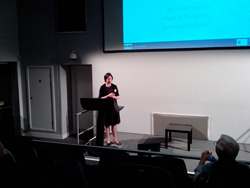 This showcase took place on 27th September in Stanley Quek Lecture Theatre, TBSI, Trinity College Dublin. The Discipline of Radiation Therapy at Trinity College Dublin (TCD) hosted a patient-centred exhibition and public outreach event aimed at promoting knowledge and awareness of radiation therapy in the general public at the Science Gallery, TCD on the 21st of June 2013. The purpose of this event was twofold. 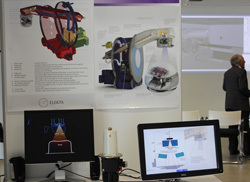 First, it was a public information event about radiation therapy, which included information sessions for the public as well as showcasing the Discipline’s European achievements, as part of Ireland's EU presidency. 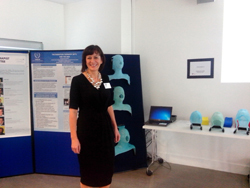 The Discipline also launched its research group, ARTT (Applied Radiation Therapy Trinity) at the event. This was the first event of its kind in Ireland and the outcome of promoting an awareness of radiation therapy and dispelling the many myths that exist surrounding its use were achieved during the event. Michelle Leech, Associate Professor and Mary Coffey, Adjunct Associate Professor have recently been invited to join the Union of International Cancer Control's Global Task Force on Radiotherapy for Cancer Control. 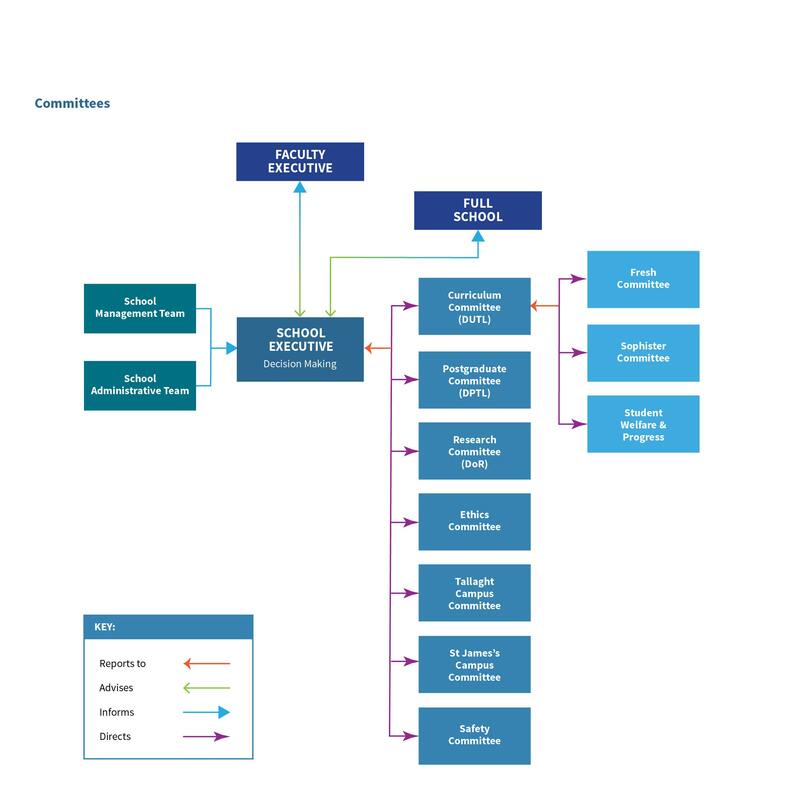 The remit of the task force is to ascertain what investment is required to bring global radiotherapy services to an acceptable standard. 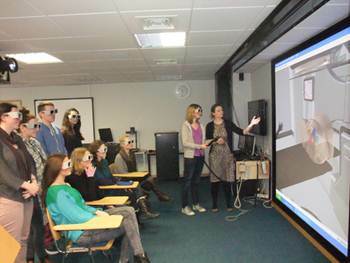 The Discipline of Radiation Therapy runs two separate work-experience weeks for transition year students each year, taking 16 students for each session, as part of a college wide programme. Students are selected from a range of schools around the country to maximise school participation. The students spend some time in the molecular medicine laboratory and the remaining time is devoted to providing an overview of the course and clinical aspects of radiation therapy. The Discipline is actively involved in the Trinity College Open Day for secondary school students. Second-level students, mature students, guidance counsellors, teachers and parents/guardians are invited to attend. Academic staff and current students are present at this event to provide detailed course information and to discuss your course options at the many course specific stands. Other information sessions are organised throughout the year, on demand, with tours of clinical departments to give secondary students an insight into what a career in radiation therapy entails. The Discipline provides information sessions for prospective students in clinical radiation therapy departments. These sessions are designed to provide students with a better understanding of radiation therapy and the role of the radiation therapist. These are organised throughout the academic year based on demand. These sessions include a visit to a clinical department where prospective students are guided though a patient’s radiation therapy journey and insights are offered into the role of the radiation therapist. Information is also provided on the degree programme and career opportunities for radiation therapists. The Discipline of Radiation Therapy is a proud supporter of this initiative. Many of our students have come through this route to third level education, and we actively encourage other students to follow suit. Established in 1993, the Trinity Access Programme is part of Trinity's contribution to tackling social exclusion, through a range of innovative, targeted initiatives for individuals who, for socio-economic reasons, have not yet realised their full educational potential. 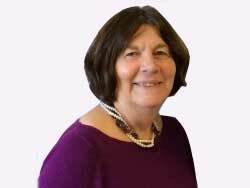 Each school has a TAP contact person (Ms. Anita O’Donovan for the Discipline of Radiation Therapy), who is a member of the teaching staff with the special responsibility of raising awareness about TAP within the school. The TAP Summer School is held for one week each June and is attended by approximately 70 5th year pupils. Summer School aims to introduce students to the physical, cultural and academic environment in Trinity College through a range of interactive and multi-disciplinary activities which take place over five days. The week culminates in an awards ceremony, where students present their project work from the week and receive a certificate of achievement from the College.